Has there been a ruling? 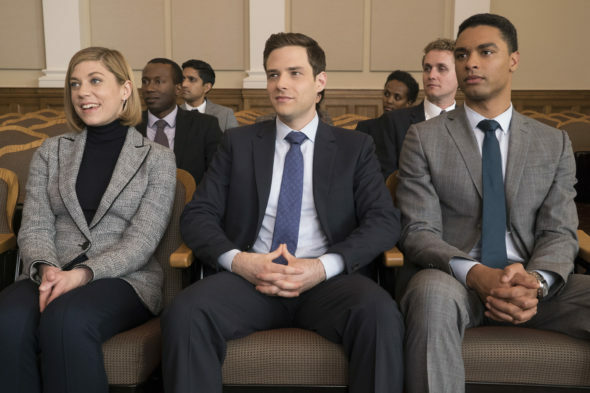 Is the For the People TV show cancelled or renewed for a second season on ABC? The television vulture is watching all the latest cancellation and renewal news, so this page is the place to track the status of For the People, season two. Bookmark it, or subscribe for the latest updates. Remember, the television vulture is watching your shows. Are you? An ABC legal drama, For the People stars Britt Robertson, Jasmin Savoy Brown, Ben Rappaport, Susannah Flood, Wesam Keesh, Regé-Jean Page, Ben Shenkman, Hope Davis, Vondie Curtis-Hall, and Anna Deavere Smith. The Shondaland TV series unfolds at “The Mother Court,” i.e. the United States District Court for the Southern District of New York. The story centers on six accomplished attorneys, who work on both sides of the law. Whether they represent the defense or the people, these young lawyers ply their trade, trying some of the most publicized cases, and in federal court, the stakes can be sky high. The first season of For the People averaged a 0.63 rating in the 18-49 demographic and 2.54 million viewers. Find out how For the People stacks up against other ABC TV shows. For the People has been renewed for a second season which will debut March 7, 2019. Stay tuned for further updates. Will ABC cancel or renew For the People for season two? The ratings started low and, save for one hiccup, haven’t gotten better. I’m sure it will be cancelled and may even be pulled off the schedule before all of the episodes have aired. For now, I’ll keep an eye on the ratings and update this page with breaking developments. Subscribe for free alerts on For the People cancellation or renewal news. 5/11/18 update: ABC has renewed For the People for a second season. Details here. Find more For the People TV series news or other ABC TV show news. What do you think? Are you glad that the For the People TV show has been renewed for season two? How would you feel if ABC had cancelled this TV series, instead? What Would You Do? on ABC: Cancelled or Renewed for Season 15? I absolutely love this show and its talented, amazing characters, personalities, and scripts… waiting with bated breath for its return! Love the show!! Please don’t cancel it! This show, For the People, is so good! Please bring it back! No New lawyers will be going to court with clients in the probably the busiest court system in the country.